This is a picture of MCC, Inc.’s rock drills. Aaron and Randy use this equipment daily. Joe is our “drilling and blasting supervisor” performing atleast one blast a day with “blasting assistant” Garrett. There is a combined total of 103 years of tackling this service between the four employees in this picture! Each of these employees are experienced and dedicated to a safe and successful outcome to their work! 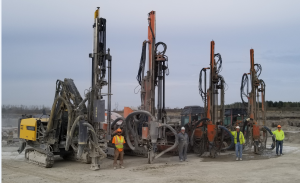 So if you need rock drilling and/or blasting, please do not hesitate to contact Kent Turkow at (920) 378-1519 or Todd Brockman at (920) 378-2209 to start planning and scheduling your next projects’ needs.